I interrupt your normal Christmas cookie blog posts to bring you this. A salad. But it’s not a regular salad, it’s a cool salad! Actually it’s not a cool salad at all. It’s a warm salad, which makes it perfect for winter! I love salads, and eat them all the time. And I especially crave them during the holiday season when I’ve had too much sugar from all the fun Christmas cookies and treats. But some days when it’s negative 15 degrees outside, the last thing you want to eat is a bowl full of cold lettuce and raw veggies. 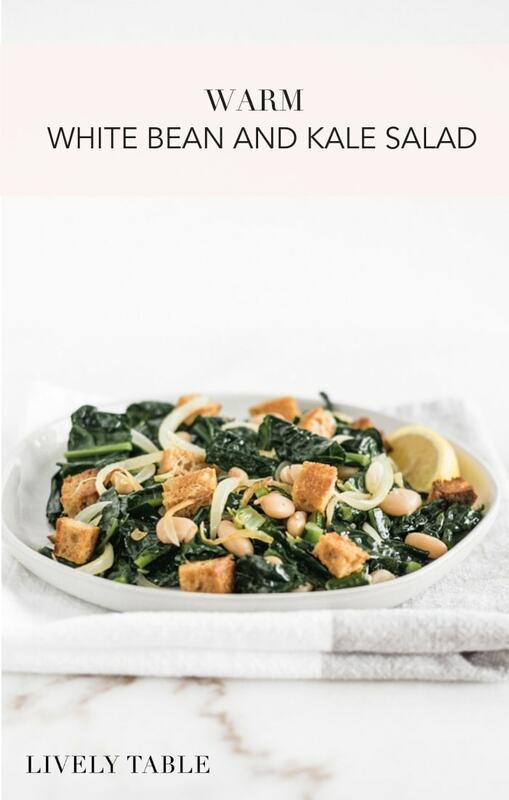 That’s why I’ve made this delicious Warm White Bean Kale Salad! 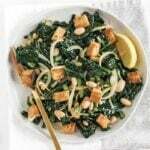 The kale is cooked with flavorful garlic and caramelized onions until wilty and warm so it’s the perfect comforting salad for cold days. 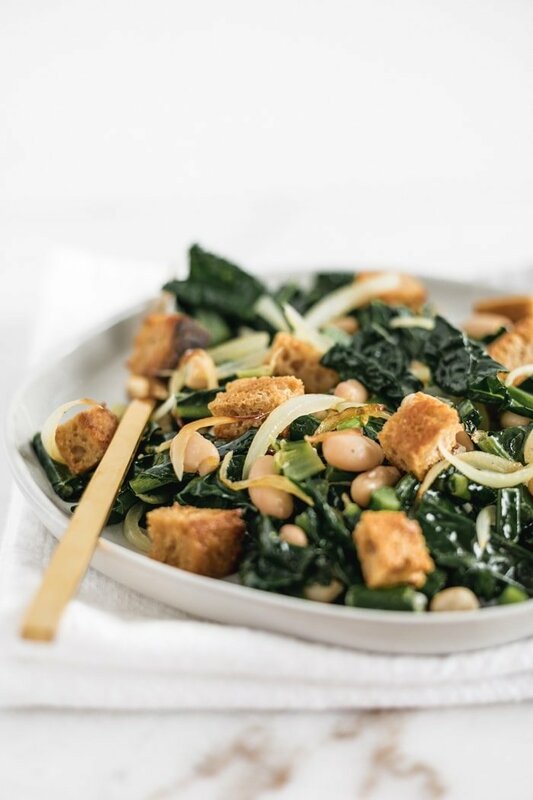 It’s also loaded with white beans and crunchy homemade croutons for a variety of textures and flavors all on one super easy salad. A squeeze of fresh lemon takes the flavor over the top without having to add any extra dressing. I love to pair this salad with an Italian inspired dish, like my Greek chicken, but it really goes well with anything from salmon to soups! 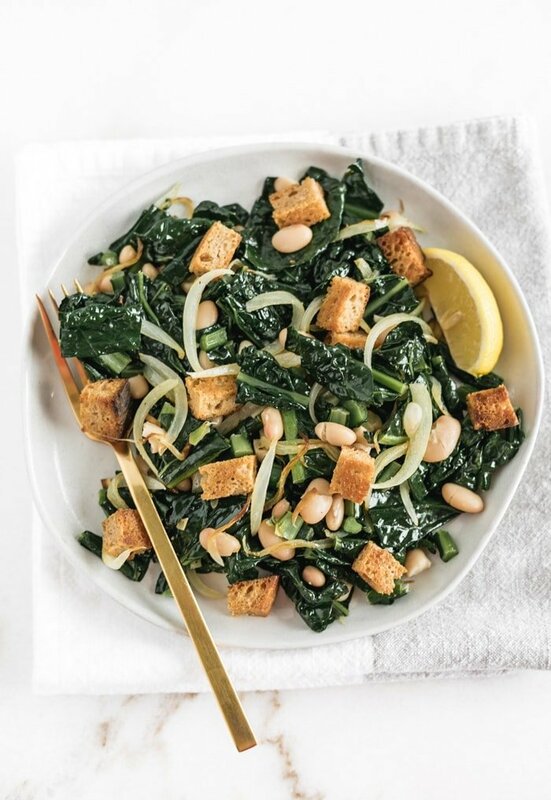 This Warm Kale and White Bean Salad would also make an excellent vegetarian lunch. It’s so simple to throw together (great on busy days!) and it’s got loads of filling fiber and plant based protein. Or pair it with a cup of roasted butternut squash soup for an extra cozy meal! 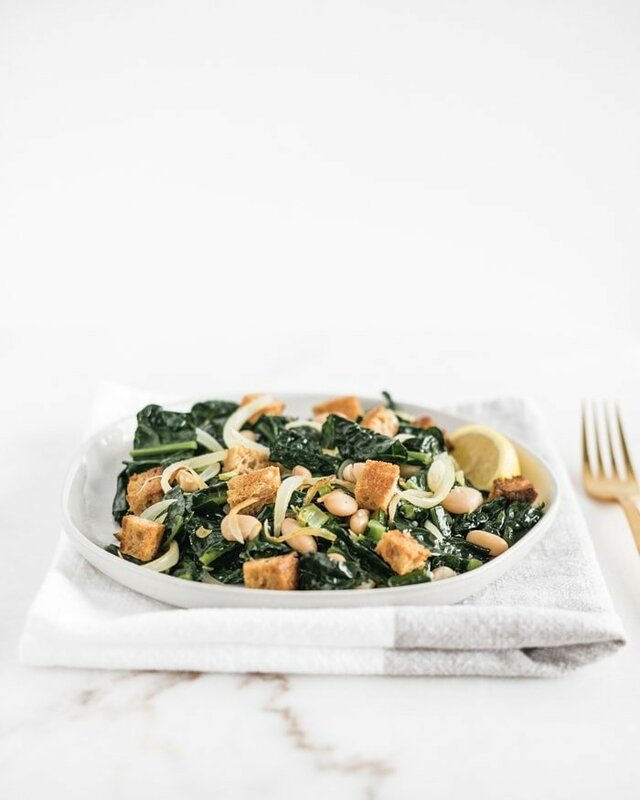 I like to mix this salad up and throw on some parmesan or chickpeas instead of white beans (whatever’s on hand!). Feel free to make it your own. Back to your regularly scheduled holiday programming. 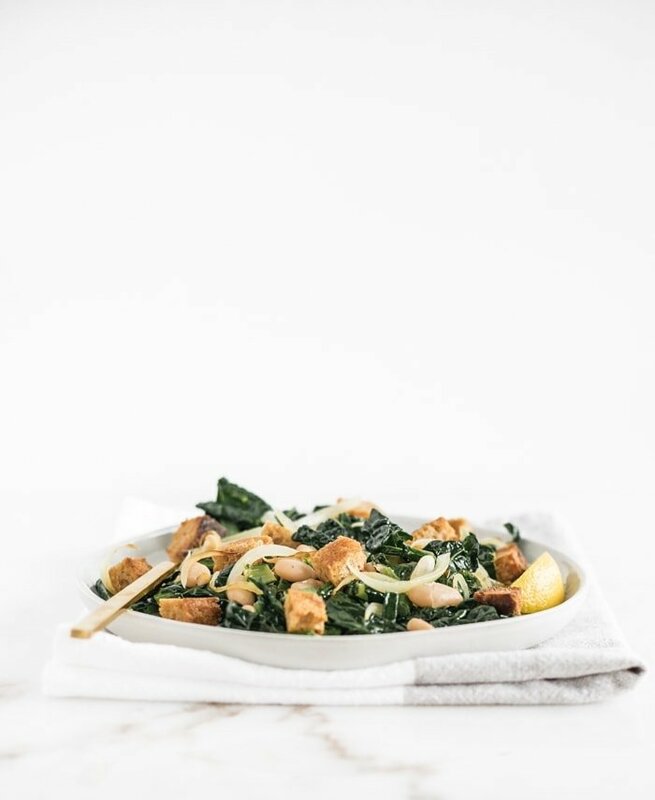 To make croutons, preheat oven to 400° F. Cut 1-2 pieces of whole grain sourdough into cubes. Toss with 1/2 tsp olive oil, a pinch a garlic powder, and a pinch of dried rosemary. Spread on a baking sheet and bake 10-15 minutes, stirring, or until crispy. Remove from oven and set aside. In a large skillet, heat oil over low heat. Add garlic and onions and sauté until onions are caramelized, about 10 minutes. Add kale and cook until kale is warm and slightly wilted. Add white beans and stir until beans are heated through. Remove from heat and squeeze lemon juice over the top. Sprinkle with salt and pepper to taste, then toss with croutons. Serve immediately. Love the ingredient combinations in this! Sounds fantastic!